Attach to a hero. Limit 1 per hero and 1 per deck. Action: Exhaust Magic Ring and raise your threat by 1 to (choose 1): heal 1 damage from attached hero, add 1 resource to attached hero's pool, or ready attached hero. Response: After Emyn Arnen Ranger commits to the quest, choose an enemy with a Trap attachment. Until the end of the phase, Emyn Arnen Ranger gets +X Willpower, where X is the chosen enemy's printed Threat. Reduce the cost to play Halfast Gamgee by 1 for each side quest in the victory display. Response: After Halfast Gamgee enters play, add 1 resource to a hero's resource pool. Play only if you control a unique character with the Ent trait and another unique character with the Hobbit trait. Action: Ready each damaged Ent character you control. Action: Discard an ally you control to choose and discard a Condition attachment. When Revealed: Ready each hero committed to the quest and remove Wind from the Sea from the game. Shadow: Ready the defending character. The first player gains control of Poros Garrison. Immune to player card effects. You can optionally engage an additional enemy during the encounter phase. If Poros Garrison leaves play, the players lose the game. 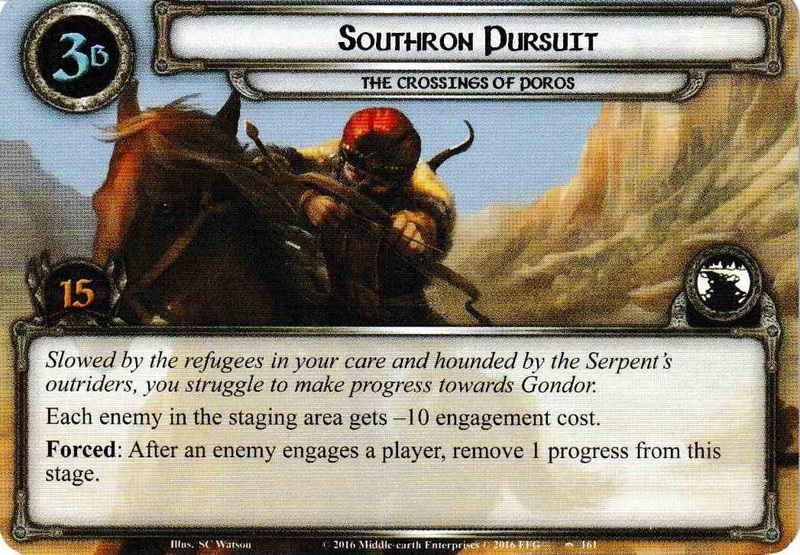 Forced: After Southron Outrider engages you, either place a random enemy from the set aside Harad Soldiers set into the encounter discard pile, or Southron Outrider gets +3 Attack this round. 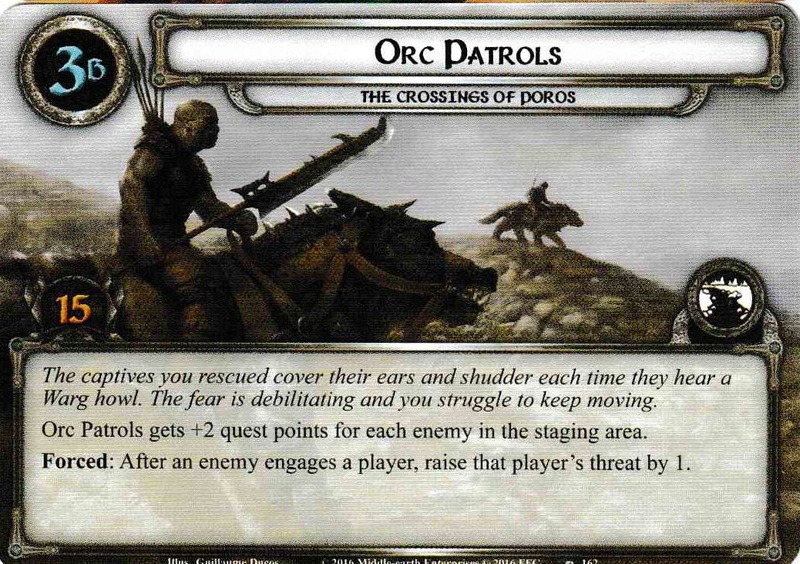 When Revealed: Either place a random enemy from the set aside Mordor Orcs set into the encounter discard pile, or Uruk Prowler makes an immediate attack against the first player. 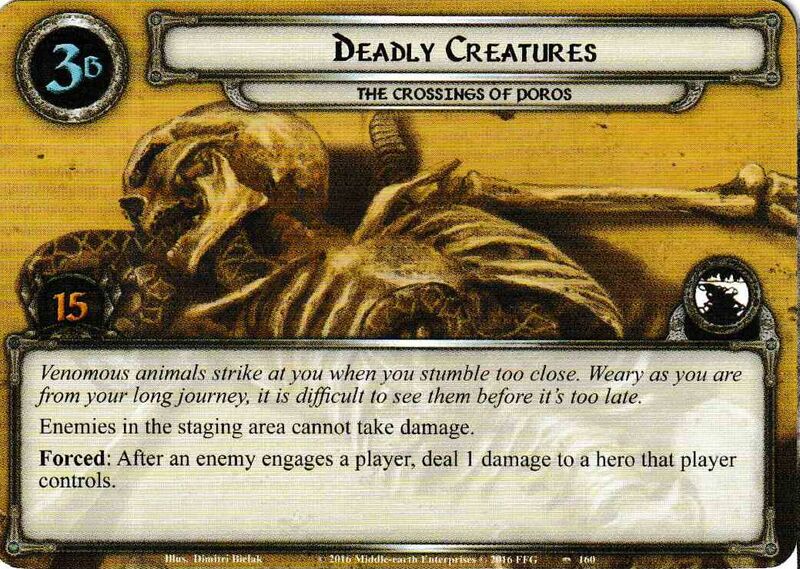 When Revealed: Either place a random enemy from the set aside Desert Creatures set into the encounter discard pile, or Desert Warg gains surge. X is the highest number of characters controlled by a single player. Forced: After Desolate Land becomes the active location, choose 1 random card from the set aside encounter set with the most cards remaining. Reveal that card as if it was part of the encounter deck. Forced: After Harondor Waste becomes the active location, choose 1 random card from the set aside encounter set with the most cards remaining and place it in the encounter discard pile. Then, shuffle the encounter discard pile into the encounter deck. Shadow: Return the attacking enemy to the staging area after this attack. When Revealed: Choose 1 random card from the set aside encounter set with the most cards remaining, Reveal that card as if it was the top card of the encounter deck. Shadow: If this attack destroys a character, resolve the 'when revealed' effect of this card. While Foothills of Mordor is in the staging area, 'when revealed' effects cannot be canceled. 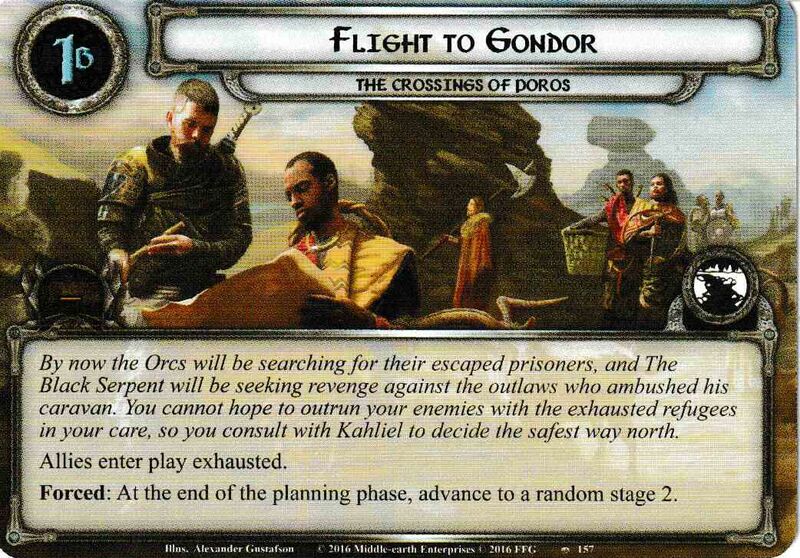 Forced: After Foothills of Mordor becomes the active location, raise each player's threat by 2. While any player has threat of 35 or higher, Shadowy Vale gets +3 Threat. Forced: After Shadowy Vale becomes the active location, reveal the top card of the encounter deck. When Revealed: Raise each player's threat by X, where X is the printed quest points of the active location. If there is no active location, Mountains of Shadow gains surge. Shadow: Attacking enemy gets +1 Attack. If this attack destroys a character, raise your threat by 2. Each player's threat cannot be reduced. Response: When Find a Way Down is defeated, each player reduces his threat by 3. 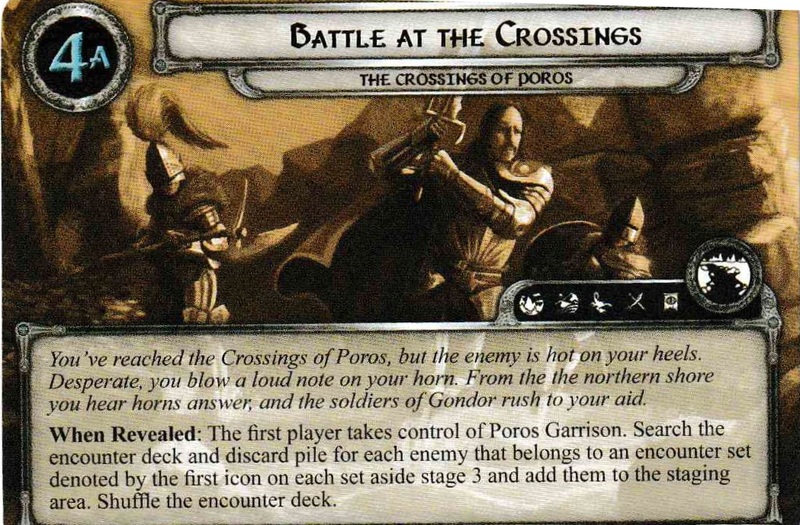 Setup: Set Poros Garrison and each of the following encounter sets aside, out of play: Mountains of Shadow, Desert Sands, Desert Creatures, Harad Soldiers, and Mordor Orcs. 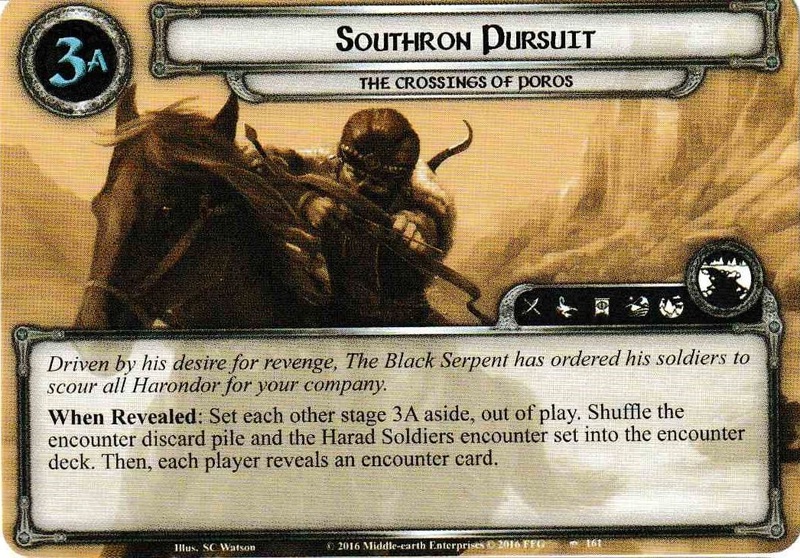 The first player adds The Black Serpent to the staging area and shuffles the encounter deck. Each other player reveals an encounter card. Allies enter play exhausted. Forced: At the end of the planning phase, advance to a random stage 2. 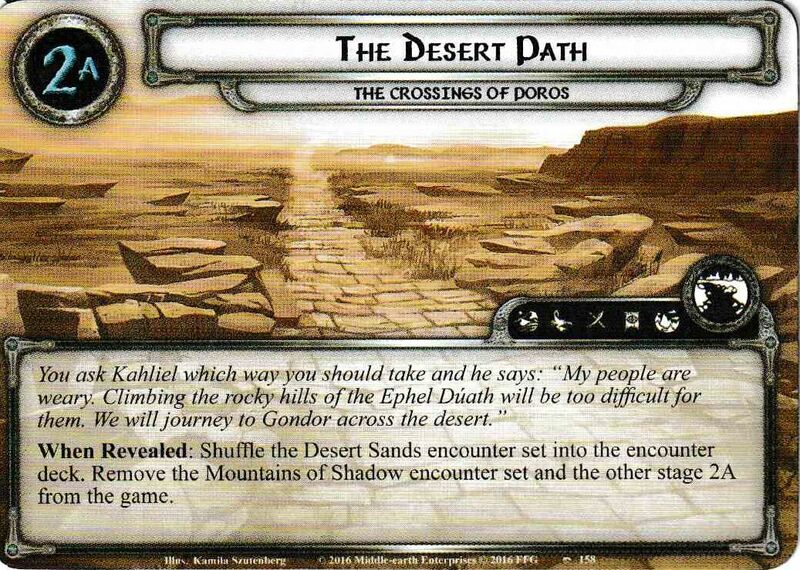 When Revealed: Shuffle the Desert Sands encounter set into the encounter deck. Remove the Mountains of Shadow encounter set and the other stage 2A from the game. Forced: After a player plays an ally, he must either exhaust that ally or deal 1 damage to it. When Revealed: Shuffle the Mountains of Shadow encounter set into the encounter deck. Remove the Desert Sands encounter set and the other stage 2A from the game. Forced: After a player plays an ally, he must exhaust that ally or raise his threat by 1. Forced: When this stage is defeated, advance to a random stage 3. When Revealed: Set each other stage 3A aside, out of play. 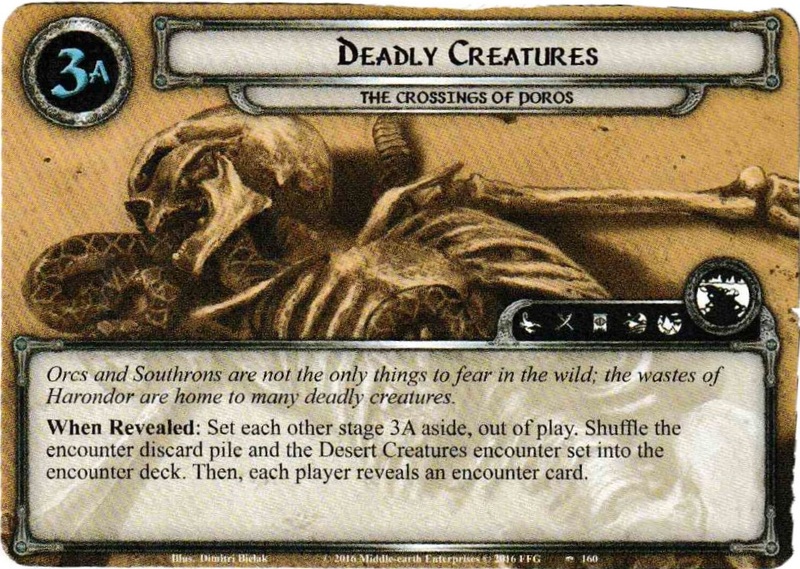 Shuffle the encounter discard pile and the Desert Creatures encounter set into the encounter deck. 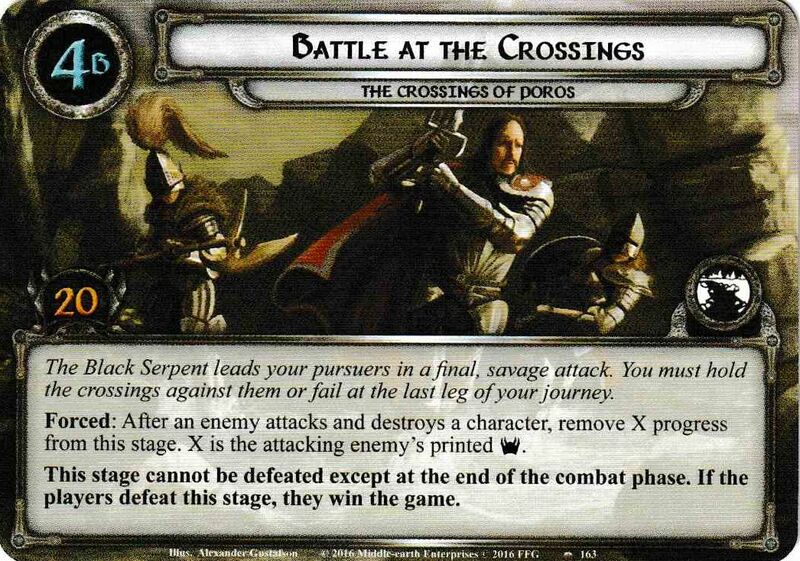 Then, each player reveals an encounter card. Enemies in the staging area cannot take damage. Forced: After an enemy engages a player, deal 1 damage to a hero that player controls. When Revealed: Set each other stage 3A aside, out of play. 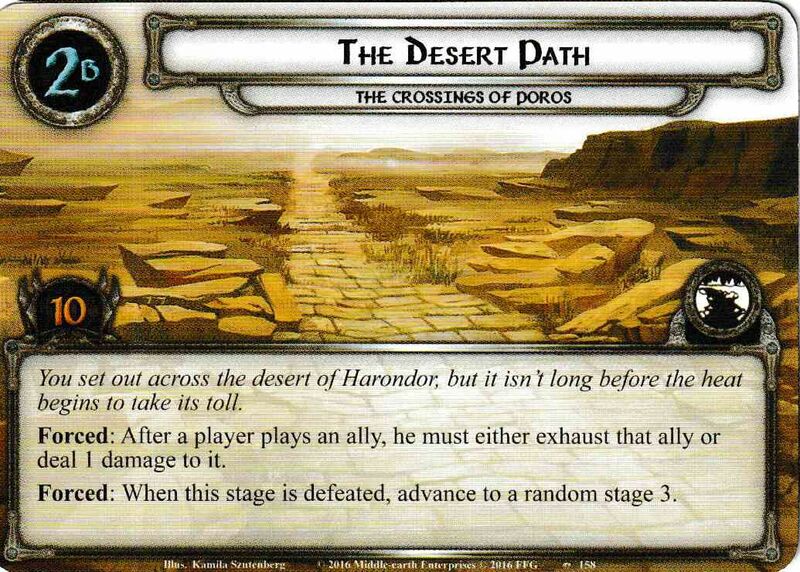 Shuffle the discard pile and the Harad Soldiers encounter set into the encounter deck. Then, each player reveals an encounter card. Each enemy in the staging area gets -10 engagement cost. Forced: After an enemy engages a player, remove 1 progress from this stage. When Revealed: Set each other stage 3A aside, out of play. Shuffle the encounter discard pile and the Mordor Orcs encounter set into the encounter deck. Then, each player reveals an encounter card. 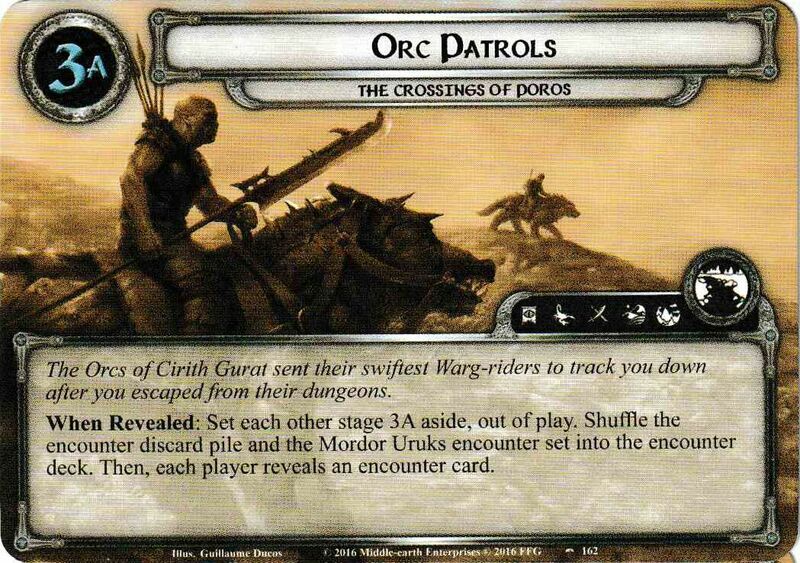 Orc Patrols gets +2 quest points for each enemy in the staging area. Forced: After an enemy engages a player, raise that player's threat by 1. When Revealed: The first player takes control of Poros Garrison. Search the encounter deck and discard pile for each enemy that belongs to an encounter set denoted by the first icon on each set aside stage 3 and add them to the staging area. Shuffle the encounter deck. Forced: After an enemy attacks and destroys a character, remove X progress from this stage. X is the attcking enemy's printed Threat. This stage cannot be defeated except at the end of the combat phase. If the players defeat this stage, they win the game.